Description: Shell robust, sub cylindrical to campanulate, with the large abdomen bearing three latticed feet. Cephalis subspherical, with few small pores, bearing a short, broadly conical horn. Collar stricture usually pronounced, but less so when the wall of the cephalis is very thick. Thorax hemispherical, thick-walled, with subregular circular pores and surface smooth or slightly thorny. 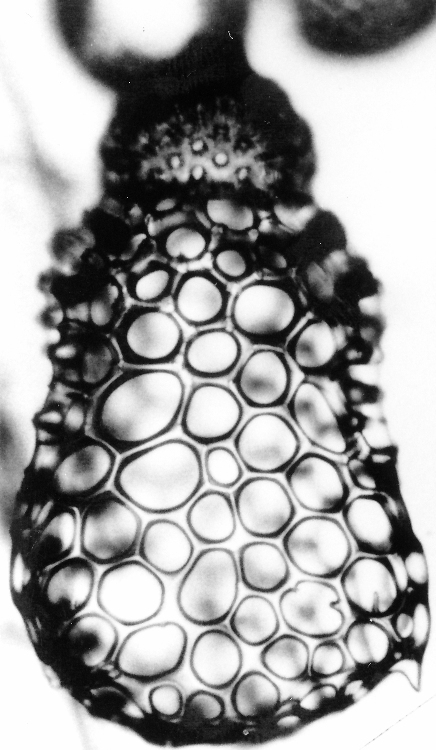 Abdomen subcylindrical or expanding distally, with robust bars separating large pores of variable size. The abdomen passes terminally into three irregular, coarsely latticed feet. Remarks: This species differs from all others of the genus in possessing latticed feet. Dictyopodium eurylophos Ehrenberg (1873, p. 223; 1875, pl. 19, fig. 4) and D. oxylophos Ehrenberg (1873, p. 223; 1875, pl. 19, fig. 5) have latticed feet, but their entire skeleton and the meshes of their abdomen and feet are much smaller. This species is named for E. Dean Milow, who noticed this species during his investigation of radiolarians from Leg 3 of the Deep-Sea Drilling expedition. The phylogenetic origin of Cyclampterium (?) milowi is obscure. C. (?) pegetrum is apparently its immediate descendant.